Futaba RC Receiver R6008HS. Condition is Used. Dispatched with Royal Mail 1st Class. The R3106GF uses Futaba's T-FHSS Air Mono system so it works with all T-FHSS aircraft transmitters from the top of the range T18MZWC to the entry level T6L. NOT COMPATIBLE WITH FUTABA 8J,6EX 6J TRANSMITTERS. Futaba 6 Channel Radio Control System Good condition extra receiver, no servos. Futaba 6 Channel Radio Control System Good condition extra receiver, no servos.. Condition is Used. Dispatched with Royal Mail 1st Class. Supplied as standard with the new 3PRKA radio system, the R203GF receiver utilises Futaba’s new S-FHSS transmission system for ultimate reliability and interference rejection qualities. Modulation: S-FHSS & FHSS. 3 off 8 channel receiver modules. Futaba R617FS Receiver, Little used, slight removable stickiness on the base. 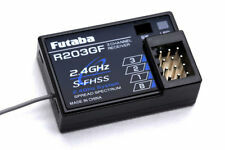 FUTABA R2008SB 2.4GHZ 8-CHANNEL S-FHSS S.BUS RECEIVER. Condition is Used but like new never flown more than one for sell Dispatched with Royal Mail 1st Class. X8 transmitters All have battery cover, some have batteries Unknown age, condition and working order. Used Futaba Dual Conversion "FP.R138DF" 8 Channel Receiver. FM 35MHz. Used Futaba Dual Conversion "FP.R138DF" 8 Channel Receiver. FM 35MHz..
Genuine Futaba T6L R3106GF. • Futaba R3106GF receiver included. The new T6L Sport from Futaba has been designed to be the perfect entry level 6 channel radio, with everything that is required included, but without the costly extras that generally are not needed with most normal models. Suitable for use with any Futaba FASSTest aero transmitters such as the 14SG, 16SZ, 18SZ and 18MZ. There is a small ding on the end of the antenna which can be seen in the photograph because the. Condition is Used. The T4PM utilises the ultrafast signal transmission T-FHSS SR. SUPPLIED WITH FUTABA R304SB RECEIVER. This new system brings in a locked in feel and response that racers and performance drivers will truly appreciate. Futaba Digital Proportional R/C System. Condition is Used. Dispatched with Royal Mail 2nd Class. T2HR Transmitter. • R202GF Receiver. The new Futaba 2HR radio is designed for those car, boat and glider modellers that need a high quality yet affordable 2 channel 2.4GHz system, and includes steering dual rates, servo reversing, ability to offset the neutral stick position and option of adding a ratchet to the throttle stick. This transmitter has not been tested. Vintage (1980s) Ripmax Futaba System. Consists of transmitter, 2 servos, receiver, battery holder/switch, original instructions, crystals, servo horns, servo saver and servo tape. Listed as used due to age but has never actually been used/installed. Battery tested immediately before listing and all works perfectly (both servos turn with transmitter. Please see pictures for contents/condition. Any questions/additional details please just message me. Supplied with the new 6JG radio set, the 6 channel R2006GS full range receiver is both small and light, and uses Futaba’s advanced FHSS transmission system for superior interference rejection. It can be used together with a wide range of Futaba transmitters, including 2PL, 3PL, 4PL, 4YFG and 6JG,& 8J and can operate as both FHSS and S-FHSS. Part has been tested using a Futaba Field Force 7 set to ensure correct operation. • Compact size. Weight: 6.7g. Modulation: T-FHSS. Suitable transmitters are FF7, FF8, FF9, 9ZAP and FC28. It will work with most of the Futaba 2.4GHz FASST aero receivers 6 and 7 ch (FASST 7ch mode, not multi channel mode receivers). Photographs show the actual item for sale. The sale is for a transmitter only. New listingFUTABA TX 6A FP_T6VA THE BELLS AND WHISTLES VERSION, PLUS 5 FUTABA RXs. FUTABA SKYSPORT 6A FP_T6VA THE BELLS AND WHISTLES VERSION, PLUS 5 FUTABA RXs.. Condition is Used. Dispatched with Royal Mail 1st Class. ALL THIS GEAR IS IN GOOD CONDITION , I RANGE CHECKED ALL OF IT ON SATURDAY 30th MARCH. 2019, LIST OF ITEMS AS FOLLOWS ONE FUTABA TX FP6VA......3 RXS FUTABA FP-R138DF DUEL CONVERSION ..... 1FP-R128DF DUEL CONVERSION RX....1 R137F. SINGLE CONVERSION RX PLUS 1 64 DC XTAL, AND 1 64 SC XTAL AND A 64 XTAL IN THE TX. THE TX HAS A GOOD BATTERY,WITH A STRAIGHT AERIAL AND YOU CAN DOWNLOAD A FUTABA INSTRUCTION MANUAL FOR THIS GEAR ON LINE. YOU CAN PICK THIS GEAR UP FROM MY HOME IF YOU WISH AND PAY CASH ON THE DAY, CHELMSFORD AREA. OR CALL IN FIRST AND HAVE A LOOK. Futaba 14SG 14-channel 2.4GHz Computer Radio System Model 2 with R7008SB. Able to transmit on Futaba's FHSS, FASST and FASSTest transmission systems, the 14SG allows the use of small, light and low cost FHSS receivers as well as FTR (Futaba Transmitter Ready) models, whilst also enabling owners of large complicated and expensive aircraft and helicopters to utilise the ultimate transmission system for reliability and interference rejection. FUTABA R607FS 2.4GHZ FASST SEVEN CHANNEL RECEIVER IN PERFECT UNMARKED CONDITION AND FULL WORKING ORDER. 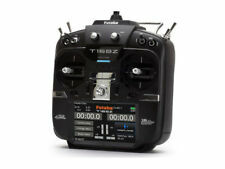 Futaba Ripmax Medallion 2 M Series Transmitter/ Controller. 2 Channel, 27MHz. Futaba 4YWD Transmitter and Receiver Set 2.4Ghz. 1 x 4 channel Futaba 4YWD 2.4Ghz FHSS Transmitter. 2 x PartCore S403 servos. 1 x 4 Channel Futaba R214GF-E 2.4GHz FHSS Receiver. Modulation: Futaba T-FHSS Air. Aerial Length: Dual Antenna diversity. Weight: 10.1g (0.36oz). Frequency: 2.4GHz. FUTABA TM7 2.4 GHZ FASST TRANSMITTER MODULE, GOOD CONDITION AND PERFECT WORKING ORDER. WORKS WITH ALL FUTABA TRANSMITTERS THAT USE THE STANDARD SIZE PLUG IN MODULE. FUTABA R149 DP PCM RECEIVER AND CHANNEL 62 CRYSTAL Light use and excellent condition. Only selling as converting to 2.4. Thank you for looking. Please see my other listings. R/C Plane Futaba R137HP 7 Ch FM Air RX on 36MHz -Pulse Code Modulation 1024.